This course requires no practical work and will be carried out entirely in the classroom. The Gloucester 17th Edition Course lasts for a total of 3 days. Upon course completion, candidates will sit an examination on the third day of the course. The exam lasts for a total of 2 hours. Upon successful completion of this course candidates will be fully qualified to undertake work to 17th Edition Wiring Regulations requirements (including Amendment 3). 40 miles from Bristol airport and just 2 miles from Gloucester train station, this course is ideal for anyone in the Gloucester area including Sandhurst, Innsworth, Abbeydale, Minsterworth, Huntley and many others. Gloucester’s 17th edition amendment one course is suited to anyone in Gloucester and the surrounding area that works in an environment requiring 17th edition knowledge and is also suitable for those who need to update from the previous versions and learn 17th edition amendment one skills. All candidates must have an interest in the subject. 17th edition is a requirement for all electricians, making this course and exam necessary for anyone seriously considering a career in the electrical industry. A pre-requisite for many other advanced courses, successfully passing this course will allow you to move on to other training programmes and further your skillset. Those attending the 17th edition course should have an interest in the electrical field, some electrical knowledge and any prior training is an advantage. Purchasing and reading a copy of the current 17th Edition Wiring Regulations book is recommended before attending the course. 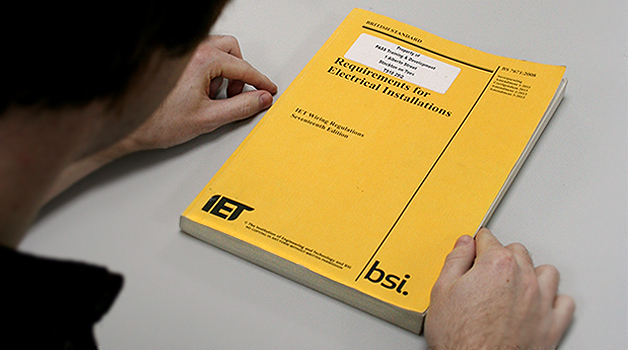 Based in Gloucester, our 17th edition electrical course covers the fundamentals of the IET Wiring Regulations, including Amendment 3 and all relevant updates. As of January 2015 electricians are required to sit the City & Guilds 2382-15 17th Edition course. The new standards are enforced July 2015. Any domestic or commercial electrician should have a familiarity with 17th Edition requirements and possess a relevant 2382-15 qualification.